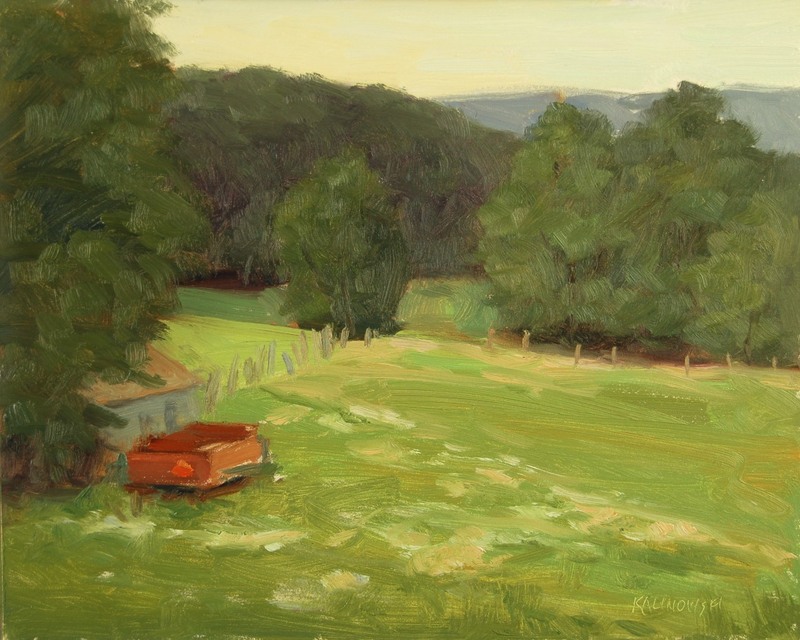 AN ARTIST'S MARK BLOG by Kathleen Kalinowski, a contemporary impressionist painter of landscapes in Oil and Pastel gives an insight to her inspiration, process and goals as a working professional Fine Artist. I am back to my blog. Sorry for the long absence... life just got in the way! 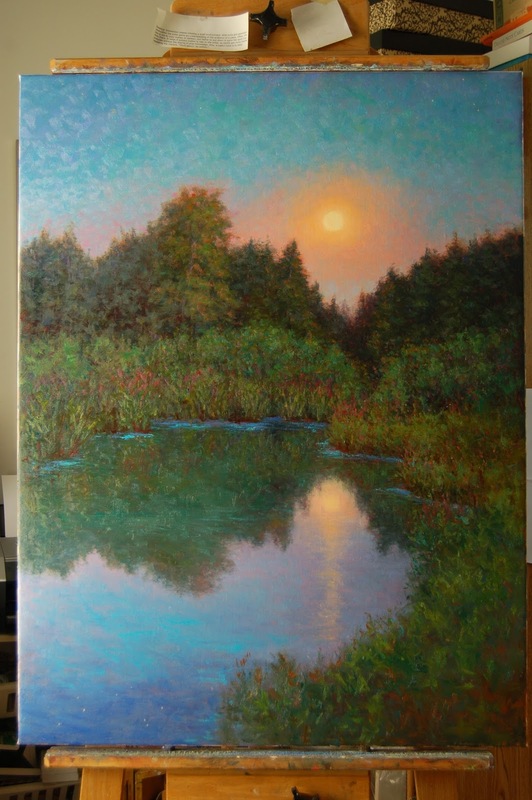 Meanwhile, I am still painting and this past fall dedicated itself to a lot of plein air painting and some larger studio works. I am currently teaching a painting class in oil and pastel on Tuesdays. Today the class was cancelled due to an abundance of snow this morning. This blog is dedicated to my faithful students who seem to like painting the still life as much as the landscape. This was painted yesterday in preparation for the still life class. The panel was toned first with Transparent Oxide Red. I used raw umber for the background and made textures with the paper towel. A langnickle brush smoothed it out. 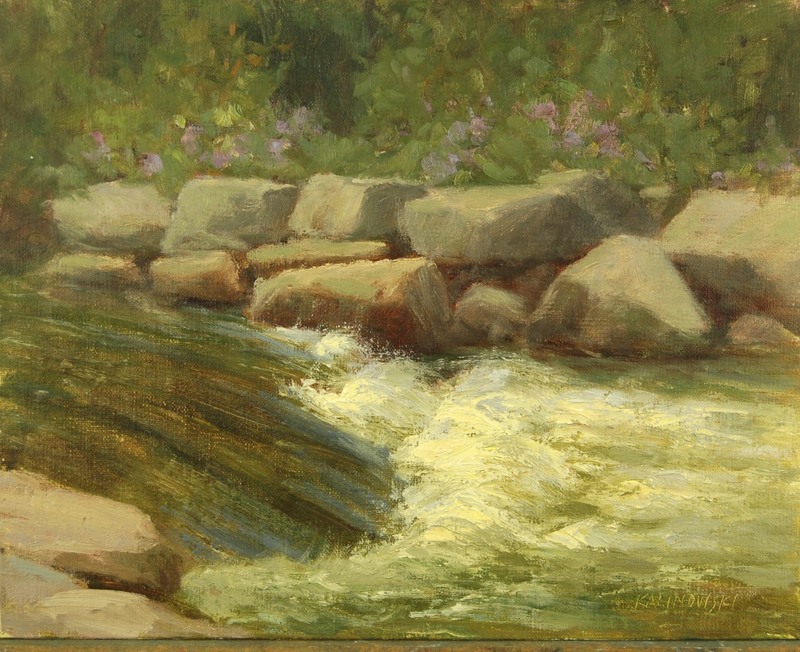 The original painting has a much darker background. 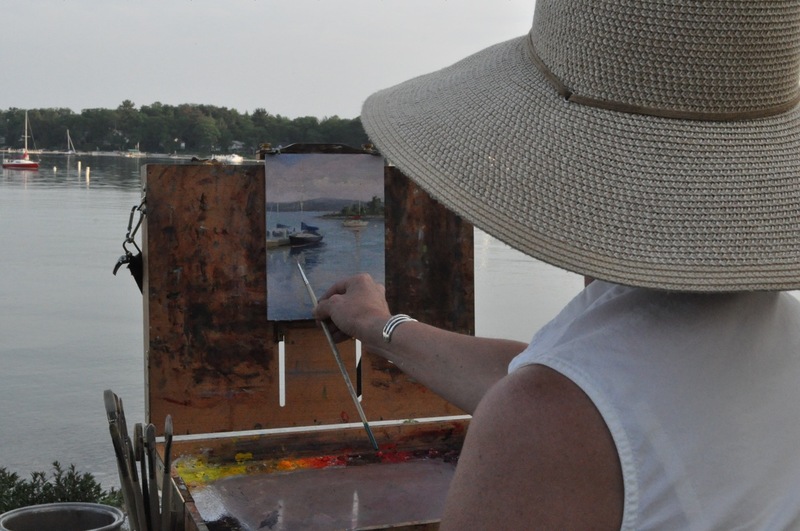 The photos here are just quick photos taken from the easel. My palette also consisted of T. white, cad yellow light, yellow ochre, cad red, transparent oxide red, alizarin crimson, ultramarine blue and chromatic black. I used the natural north light from the window behind the set up. Yesterday was a sunny day and so there was plenty of natural light. Today's first still life painting. Again the background is actually much darker on the actual painting, painted with raw umber. The white cloth has tints of white and black and yellow ochre for the cool light side and for the shadows I thinly painted a mixture of white with raw umber and TOR to warm it up. Remember, cool light has warm shadows. The still life set up with natural light behind and a cool light spotlight. I like this and may paint it again. Not quite finished with this one. 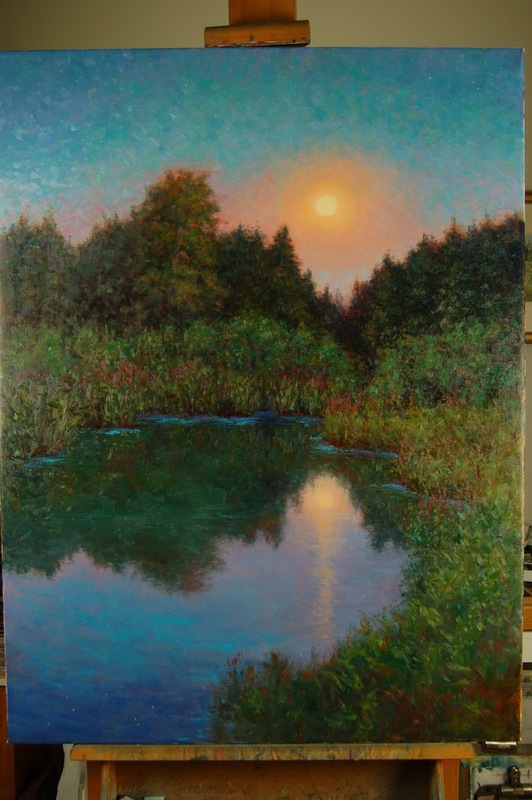 The idea for this painting started with the blue moon last August that was positioned over the pond near my home, casting a reflection. I painted several small study sketches of the blue moon using my memory to guide me in preparation of this larger version. 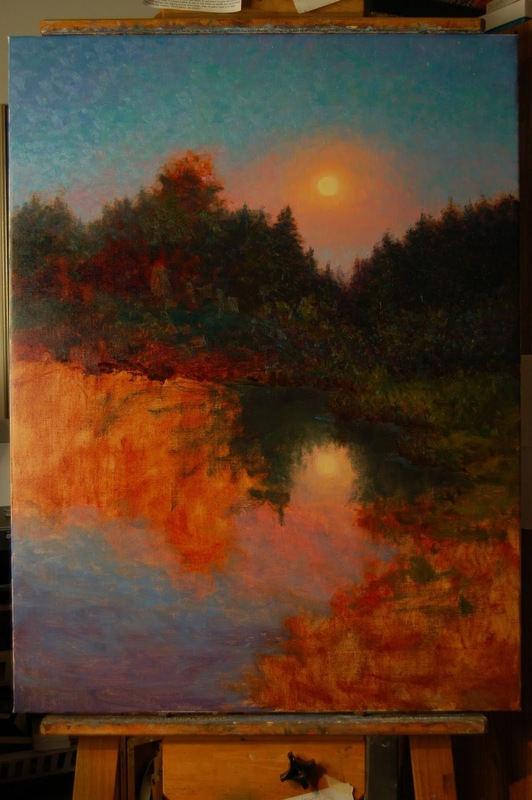 I must admit that I am a "moon chaser", always looking forward to the next full moon and to be inspired for my next nocturn painting. The beginning. A notan of thin Transparent Oxide Red paint established my composition. 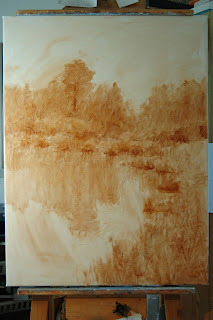 The surface is oil primed Claussens linen #13. The moon and sky and an indication of the water was painted in next. The photo here is a little dark. It took a long time to paint in the darks. I wanted to keep some areas with thin paint, yet make the darks still have form using warm and cools. At this stage, I could see the end. The reflections in the water, and the foreground needed to be painted together and wet into wet. To be on exhibit during Art Prize 2014 at the Women's City Club in Grand Rapids. Art Prize opens September 18. A limited number of giclee prints of La Luna, and a few small original paintings will be available at the venue's gift shop. 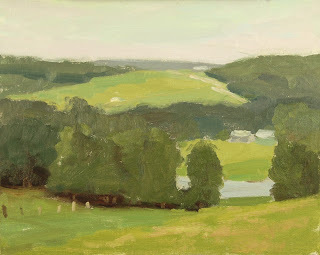 Last Thursday I met up with some local artists to paint at one of my favorite places, Townsend Park in Cannonsburg. 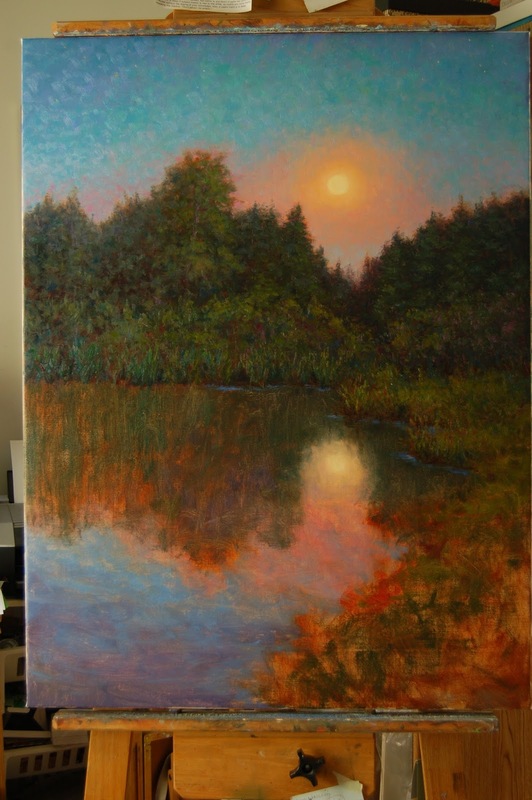 These are two of my paintings from that outing using my new Dakota Field Easel and Pastel travel box. 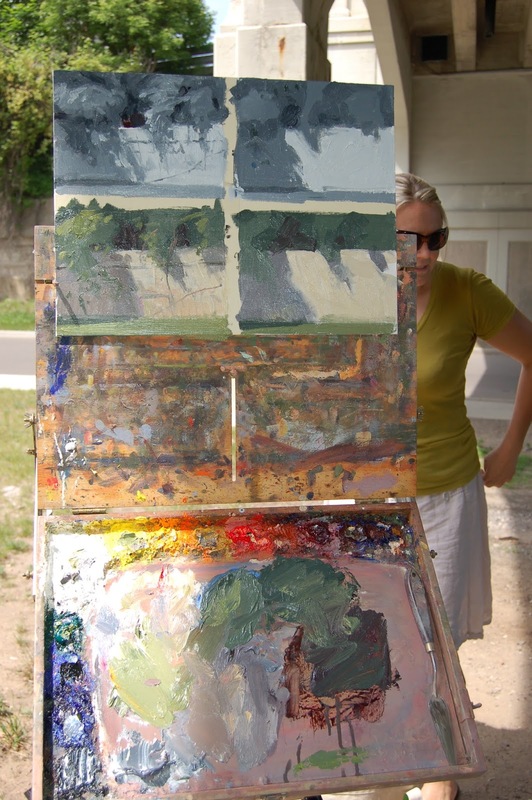 I really like the travel box, but am not so keen on the Field Easel. I think it is hard to set up and not sturdy enough. I will probably go back to the trusty old French easel for pastel plein air. Next weekend is the "Joy of Pastel Plein Air" Workshop at the Pickle Street Studio in Hopkins, MI. We have room for 3 more students - join us if you can! See my website on the Events page for more details. Whew! It has been a whirlwind of a summer! Very busy with shows and painting. I have worked more art fairs than usual this summer, some were worth the effort, some were not. I have gained some new collectors and am happy that art sales seem to be on the upswing! The best shows this year were the shows that I have been exhibiting at for many years, with a good following of collectors. That is really no surprise, as it usually takes time for folks to notice an artist and follow their career. Folks also enjoy meeting the artist and talking about the artwork. The art fair shows also help the gallery sales. Many folks will mention to me that they saw and/or purchased my work at one of the galleries that represent me. This helps the artist with credibility and helps the gallery in name and artwork recognition! I am a firm believer in gallery representation and anything I can do to help promote the galleries is good as I want them to stay in business. It would be a sad world if art galleries no longer could afford to represent artists and stay in business. Some booth shots from my 2013 shows. The paintings are all pastels. The last show is St. James Court Art Fair in Louisville, KY, October 4,5,6 . I will have both oils and pastels for sale. One of the painting exercises during the workshop was to do a memory painting. 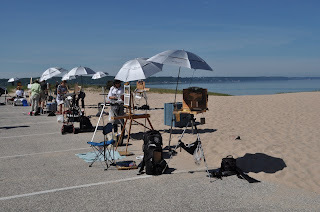 Marc took us to the beach at Petoskey State Park. 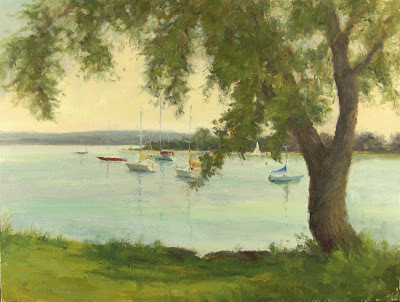 The idea is to look at the scene for a short time (5 minutes) and then paint what you remember the next 10 minutes. We repeated that sequence for an hour. 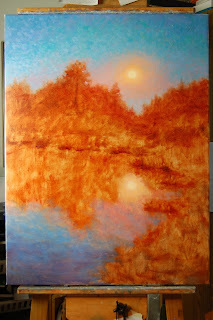 Then after a break, put that painting away and did a painting of the same scene for only an hour. The sun was hot! The memory painting is on the left. Amazing how they both pretty much look the same! Marc Hanson's dune demo. His was not a memory painting, though he showed us how he massed in the big shapes with a variety of grayed greens. The light was flat by this time, not an ideal situation. Plus it was getting quite warm with little breeze. 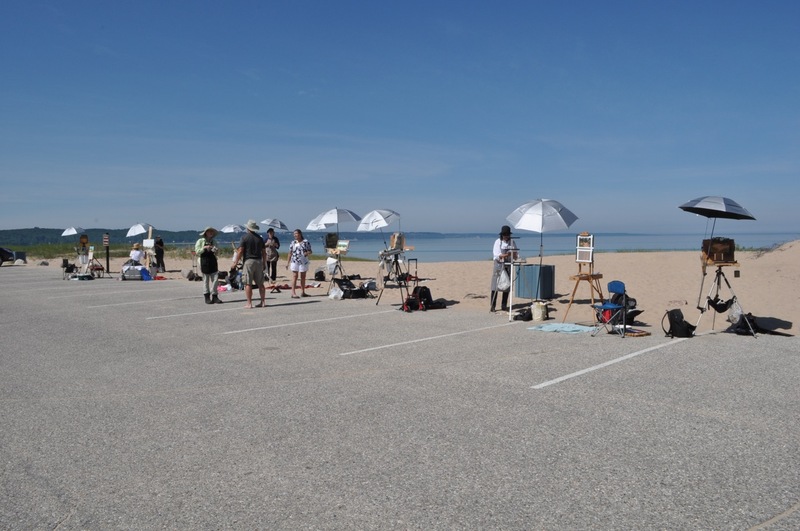 See our easels facing the lake! 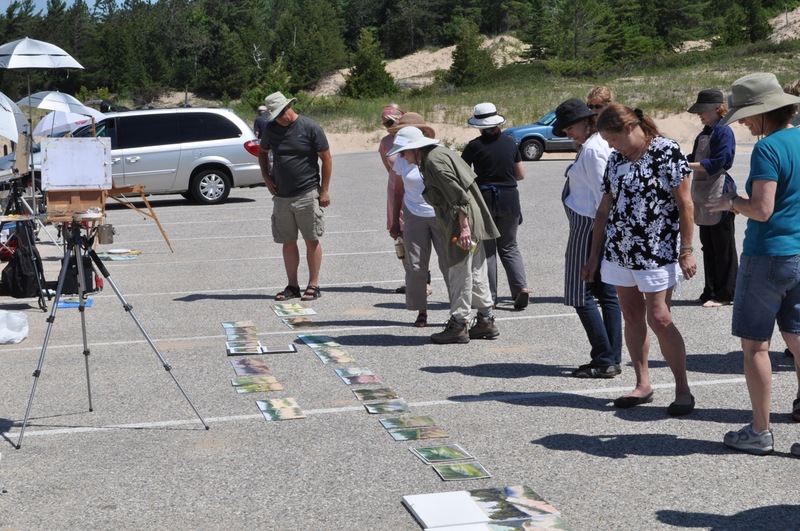 Someone driving by commented on how odd that we were painting the dunes while facing the wrong way! 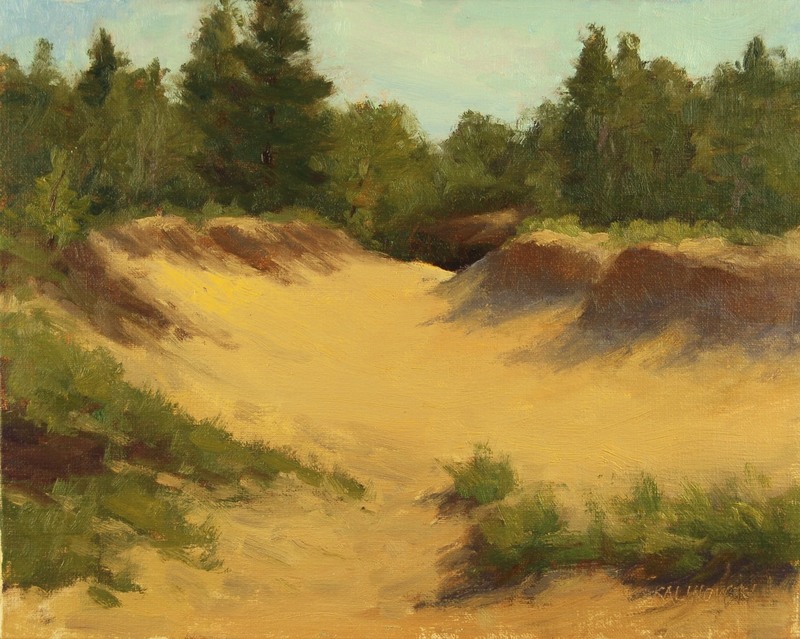 Marc Hanson's painting of the dunes. 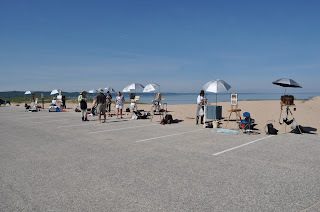 I was happy to participate in a plein air painting workshop with instructor and fabulous artist, Marc R. Hanson based at the Crooked Tree Art Center in Petoskey, MI. 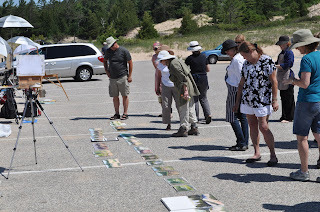 This workshop followed the weekend opening of the Oil Painters of America (OPA) Summer Salon Show. The show will be in the center until August 31, 2013. If you get a chance to see this fabulous exhibit, please look for my painting, "River Banks - Spring Thaw". 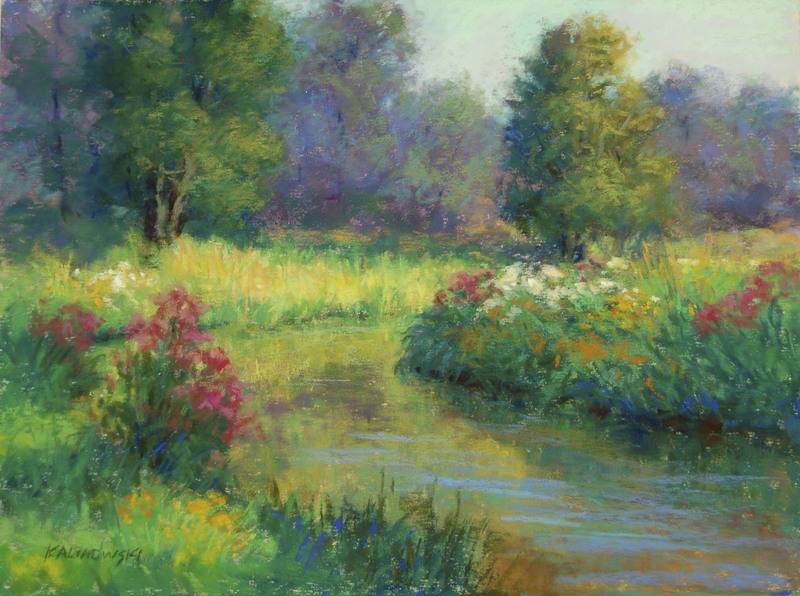 Marc Hanson's demo on using a simple black and white value study and then painting those same values with color. Square one on left is the scene with four values in black and white, below that is the same using color. My attempt using the same exercise of Bear River. My painting of the same scene using those principles of simple value structure. Marc doing a demo the next day at Bill's Farm Market. Here the demo is on using the same simple value structure and quickly painting in the large shapes using three - five values and color. Below are several of my studies from that day of painting. 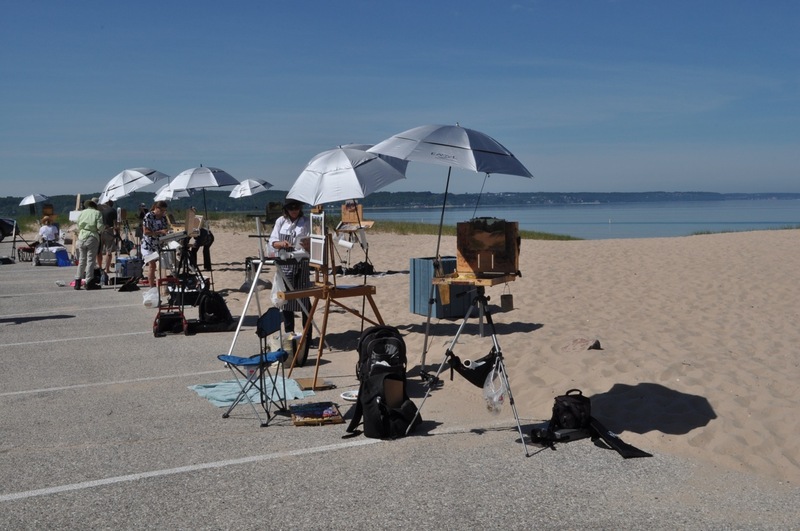 Last week Sunday while in Petoskey, MI, my artists friends and I decided to spend the day painting in Harbor Springs. 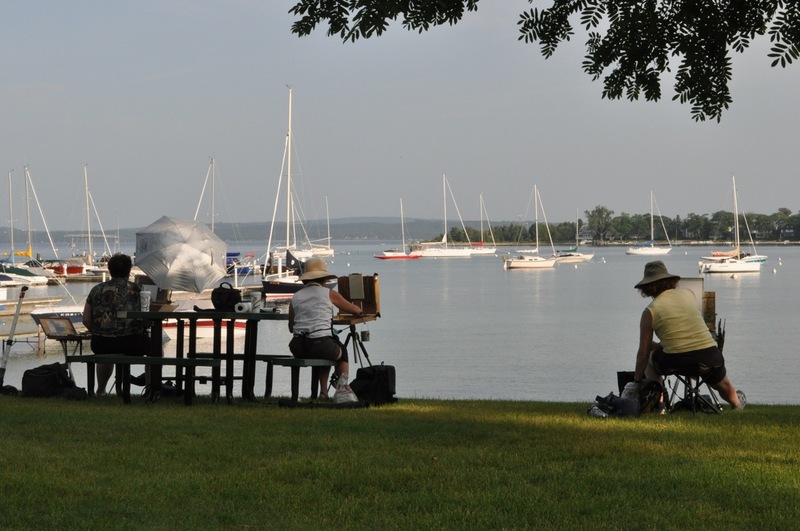 Harbor Springs in a quaint town with only five or six blocks of shops, restaurants and art galleries. There is plenty of subject matter. 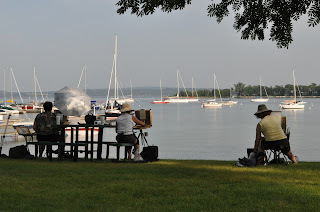 We were excited about the beautiful harbor with the sailboats so that is where we set up our easels. The first half hour was sunny, then it clouded up with fog. 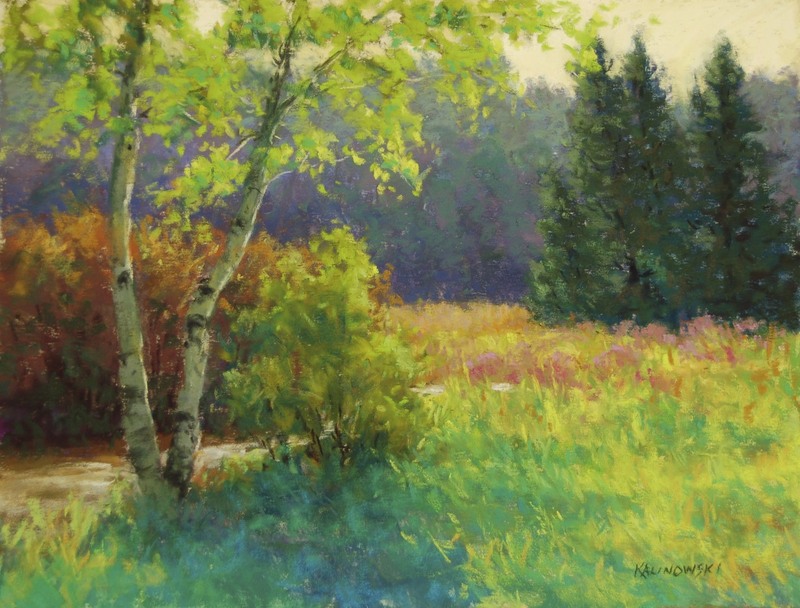 The weather changed so frequently, from calm to windy, from warm to chilly, sunny to foggy, that it was hard to establish values and color in the painting. 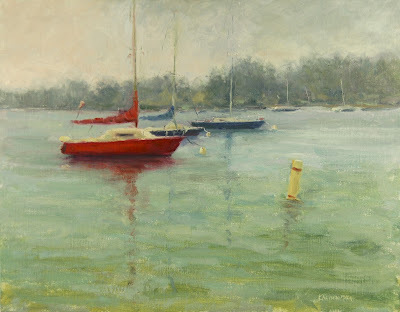 Almost gave up but I loved that red boat and so I quickly painted in the foreground water and bouy and liked the results. The owner of this boat may be interested in purchasing this piece, so it is currently on hold. That was hard work. After a lunch break, we set up to do an afternoon painting. 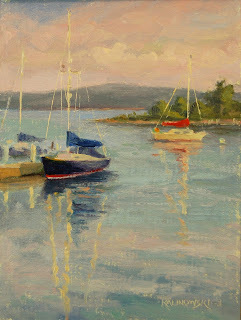 The sun was out consistently and decided to do another harbor painting from a different viewpoint. I am satisfied with this painting and will frame it! Not wanting to quite leave yet, we ate dinner at Turkeys. You know if you have been to Harbor Springs, it is the pink one with the black and white striped awning. I did a painting of it years ago and it is a charming place both inside and out. With just a little bit on energy left, we did a small evening study as well. I am an artist because I have always had an innate desire to share with others what I see as beautiful. When painting, I feel a personal connection to nature with all the sensations of light, atmosphere, mood, and color. Color is my passion. Many years of plein air painting has helped be to interpret color, and practicing outdoors is the key to creating successful landscapes. My goal is to quickly capture the light and retain my initial concept. 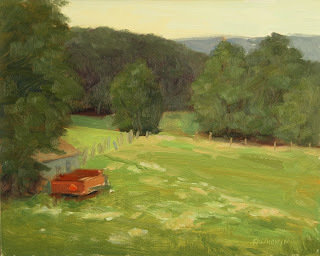 The plein air work influences my studio work by reminding me of my inspiration. My hope is that the viewer will be inspired with another understanding of how beautiful our world can be and left with a feeling of pleasure. My paintings celebrate life. 2013. 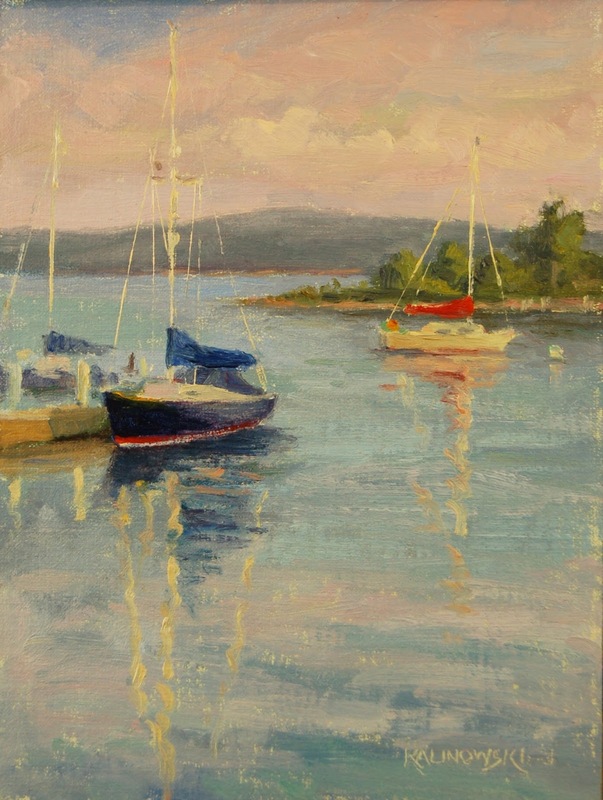 Kathleen Kalinowski, Kalinowski Fine Art. Simple theme. Powered by Blogger.